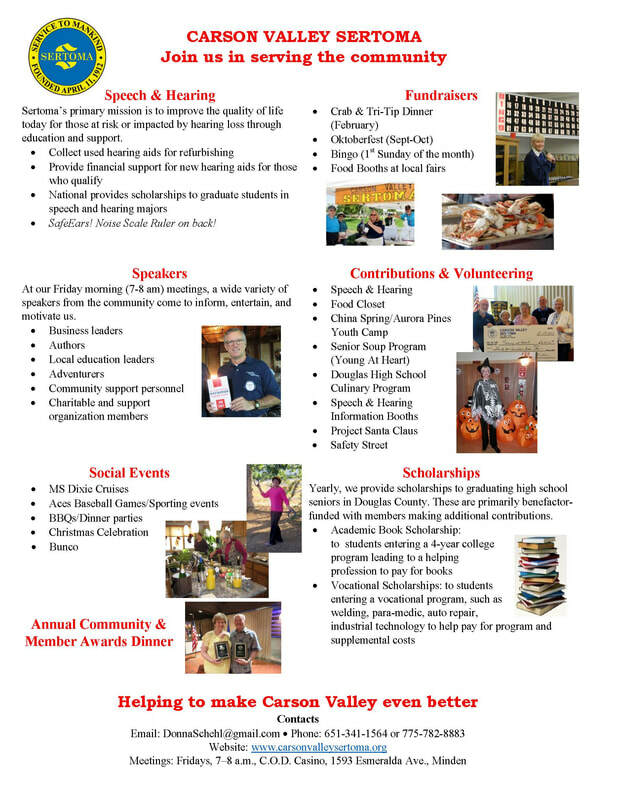 Welcome to Carson Valley Sertoma! Click here to go to Members-Only page. Click here to download this flier. New to our valley? Recently Retired? Hear from local community speakers? We offer many opportunities to get involved. Plus a monthly bingo event. We also have many other endeavors to give back to our community. Join us each Friday at 7-8 a.m. at the C.O.D. Casino, 1593 Esmeralda St., Minden and see how you can help make Carson Valley even better. For questions about membership and weekly meetings, click here to send an email to Donna Schehl. Questions and Information: Click here to go to our Contact page and send us an email to ask a question or get more information.